The Faiyum is a city in Middle Egypt, which is believed to be oldest city in Egypt due to its strategic location. Faiyum was founded around 4,000 B.C. that makes it one of the oldest cities in Africa. The city of Faiyum is located in an area that was once the ancient city of Crocodilopolis, whose inhabitants used to worship a sacred crocodile named Petsuchos. Today, Faiyum is a great city that hosts many bazaars, markets, mosques, and other interesting places. Damascus, the capital city of the Syrian Arab Republic is the largest city in country, known in Syria as ash-Sham and titled as the City of Jasmine. In addition to being one of the oldest continuously inhabited cities in the world, Damascus is also a major cultural centre of the Arab world. Damascus was founded in the 3rd millennium B.C., that makes it one of the oldest cities in the Middle East. Today, it is great city known for its so many cultural influences including some elements of Roman and Greek. But, Islam has a great influence, which is evident in the Umayyad Mosque, one of the largest and oldest mosques in the world, built between A.D. 705 and 715. One of the oldest cities in the world believed to be found in 3rd millennium B.C. During middle ages, the city was the centre point of flourishing craft industry, specializing in swords and lace. The city has total 125 monuments from different time periods in the history. The most beautiful is the 8th-century Great Mosque of the Umayyads built on the site of an Assyrian sanctuary. Athens, the capital of Greece is better known as the heart of Ancient Greece because of its powerful civilization and empire. 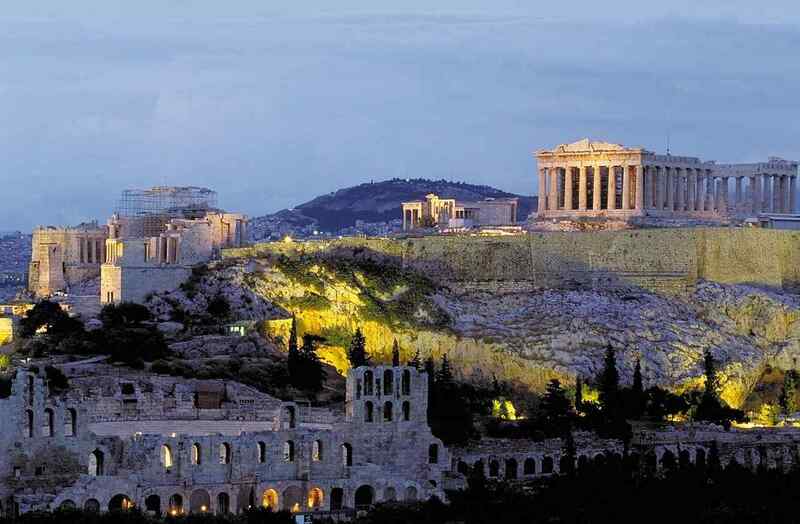 The city still features 5th-century BC landmarks, including the Acropolis, a hilltop citadel topped with ancient buildings, the Acropolis Museum, along with the National Archaeological Museum, preserves sculptures, vases, jewellery and much more from Ancient Greece. It is the largest city in Greece, and of course, one of the oldest cities in the world with continuous inhabitation since 5,000 B.C. That has a brimming history with historical gems, representing various empires such as the Roman, Byzantine, and Ottoman. The oldest city in the world has experienced all forms of government namely monarchy, democracy, socialism, capitalism, even communism. The first ever Olympic Games were held in 776 B.C. in Olympia, in Peloponnese, however, the city of Athens has its own games called the Panathenaic Games, since 566 B.C. The city was known to be the first known democracy. The system was based on direct democracy system where eligible citizens directly voted on laws. Rayy, formerly one of the great cities of Iran, is the oldest city in the province and one of the oldest cities in the world with evidence supporting the fact the inhabitants dating back to 6,000 B.C. The city was a sacred place in the Avesta, which are the ancient scriptures of Zoroastrianism. Also, the city was captured by Arabs in A.D. 641 and was almost destroyed by the Mongols in 1220. But today, the historical monuments that survive include the 12th-century Tughrul Tower and the 5,000-year-old Cheshmeh Ali Hill, ‘a hill with a spring’ and an excavation site where 7,000-year-old artefacts were discovered. Jericho is the city is located near the Jordan River, Palestine. It is believed to be one of the oldest inhabited cities in the world and also the city with the oldest known protective wall in the world. The city also features the oldest stone tower in the world but recently, excavations at Tell Qaramelin Syria have discovered stone towers that are even older. Archaeologists have discovered the remains of more than 20 successive settlements in Jericho which dates back 9000 BC. One of the oldest cities in the world has also known to be the oldest known protective wall in the world. It is also believed to have the oldest stone tower in the world, however, excavations at Tell Qaramel in Syria have discovered stone towers that are even older. The city is also described in the Hebrew Bible as the “City of Palm Trees”. Byblos is an ancient Phoenician port city of Gebal, located on the coast of the Mediterranean sea in Lebanon. Byblos is among the oldest cities in the world that have been continuously inhabited for over 7,000 years. Being one of the oldest Phoenician cities in the world, Byblos features ruins of many successive civilizations. Also, it was designated as a UNESCO World Heritage Site and is an ideal tourist spot known for its fish restaurants, open-air bars, and outdoor cafes. The city also features many historical buildings and archaeological sites to make it a great destination for visitors. This was the first city built by the Phoenicians and many Egyptian artefacts have been found around Byblos that provide proof to the historians that the city maintained a healthy trade relationship with Egypt. There are many artefacts dating to 1200 BC that shows the existence of a 22-character alphabet used by the Phoenicians at the time. Gaziantep, a city in the western part of Turkey, Southeastern Anatolia, is the sixth-most populous city in Turkey and one of the oldest continuously inhabited cities in the world. It is the sixth-most populous city in Turkey and is an important economic centre for Southeastern and Eastern Turkey. Also, Gaziantep has the largest organized industrial area in Turkey and holds the first position in terms of exports and imports. It is one of the leading producers of machined carpets in the world with over 100 carpet facilities in the Gaziantep Organized Industrial Zone. Plovdiv in southern Bulgaria is an ancient city built around the 7 hills. Plovdiv is the second-largest city in Bulgaria and a major Roman city. The city is a major cultural centre and boasts many ancient remains, including a Roman amphitheatre and aqueduct, and Ottoman baths. Today, Plovdiv is a famous tourist destination that serves as a gateway to many interesting places. One of the oldest cities is also known as City of the Seven Hills because it was built on 7 hills around the Maritsa River, however, one of the hills was demolished over a hundred years ago and now we have only 6 hills but the name is still same. Plovdiv is one of the popular tourist destination and much affordable one with hotels and restaurants are quite cheap. Sidon, translated as ‘fishery’ or ‘fishing-town’, is the third-largest city in Lebanon. It is located on the Mediterranean coast, Beirut. The area of Sidon was inhabited dating back to 4,000 BCE. In the years before Christianity, Sidon had many conquerors such as the Assyrians, Babylonians, Egyptians, Persians, Greeks, and finally Romans. But, the ancient city of Sidon even today has many cultural influences including, ruins of fortresses, the temple of Eshmoun and the Castle of the Sea and much more. Aleppo is a city in Syria and the most-populous Syrian governorate. Today, Aleppo is probably the second-largest city in Syria after the capital city of Damascus. Also, Aleppo is one of the oldest continuously inhabited cities in the world, believed to be inhabited since the 6th millennium BC. These are the oldest cities in the world. Do post your comments.